It’s been a little while since we reviewed a bean to cup machine, but I recently came into possession of this Barista Express machine by Sage – so thought I’d best put it through its paces and see how it performed. As the name implies, this BTC machine is intended to get quality coffee ground and poured quickly. The manufacturer claims that the Barista Express will get you ‘from bean to Espresso in under a minute’ – so let’s see how we get on. The only downside with the Barista Express is its identity crisis – it is a fairly manual machine and so not really an ‘express’ BTC coffee maker in my view. But if speed isn’t your primary concern and you are looking for a solid and durable BTC machine that delivers great results – this may be just up your street. The first thing to say about this machine, is that the coffee production process is relatively manual. With many of the more expensive machine you can literally pop your cup under, hit a button and the machine goes off and does the rest. Not so with the barista express, as you are in charge of choosing the right portafilter basket, choosing how much ground coffee you want and how fine you want the grind to be. You are then responsible for collecting the grounds in the portafilter, tamping, and then placing the portafilter under the water dispensing side of the machine to brew your coffee. The steam wand is also manual, so you are responsible for frothing and/or heating your own milk. (Indeed, I’m not 100% certain this necessary qualifies as a BTC machine). Obviously this is either a negative or a positive depending on which camp you are in. If you just want a no-fuss cup of coffee from ground beans then this may not be the machine for you (take a look at our selection of the best BTC machines for some alternative suggestions). But what this slightly more manual approach gives you is fine control – so you can really dial in the perfect cup for you, and ultimately, this approach will result in better coffee. But it is a little fuss. The Barista Express comes in two models – the BES875UK (which is the brushed stainless steel version you see here) and the SES875BKS – which is exactly the same but for the colour, which is ‘black sesame’ according to the manufacturers and will set you back an extra £50-ish. A – This is the bean hopper. This is fully removable and feeds beans down into the stainless conical burr grinder (which does a great job incidentally). B – This dial controls the fineness/coarseness of the grind. C – This dial controls how much coffee is dispensed per shot. D – This button selects whether you are using a single or a double portafilter – if you choose double, then double the amount of ground coffee you selected with knob C will be dispensed. E – This is the tamper, and it slots away nicely here into the machine, which is a small thing – but a really nice touch as it just sits neatly here until the next time you wish to use it, rather than being lost in a kitchen cupboard somewhere. F – This is the portafilter holder and holds your filter securely in place while the ground coffee is dispensed. 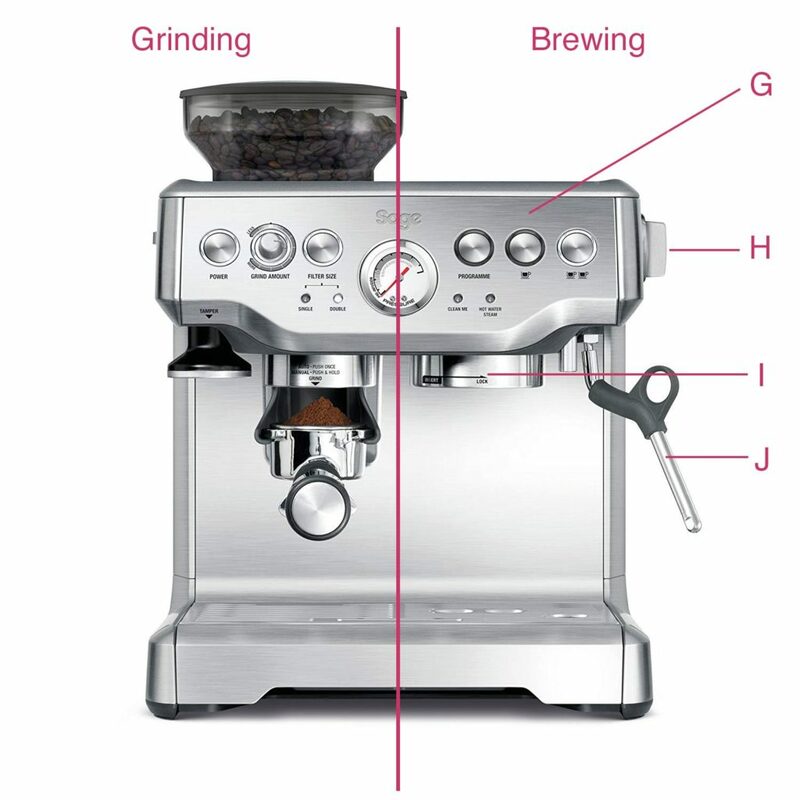 In order to activate the grinding and dispensing, you just push the portafilter in here towards the body of the unit and the machine whirrs into life. So hopefully you can see how much control there is over the grind here and that it really is up to you to tweak this to how you like it. Perfect for some people, but potentially a bit of fuss for others. G – I have grouped these 3 buttons together, as these are used in conjunction with one another to programme in the amount of water dispensed for a single and a double shot of coffee. H – This is the steam wand control. Can be used to dispense steam and also hot water. I – This is where the portafilter is attached (once full of ground coffee and tamped) and where the water is dispensed from to brew your coffee. One other neat thing to mention is that this machine comes with 4 portafilter baskets – 2 pressurised and 2 non-pressurised. The pressurised baskets can be used if you don’t want to worry too much about getting the grind perfect as they are a lot more forgiving. The unpressurised baskets will generally produce better coffee – as long as you know what you are doing. All of these baskets can be neatly stored away out of sight underneath the drip tray at the bottom. Really neat and tidy. Also of note is the stainless steel milk frothing jug that comes included. 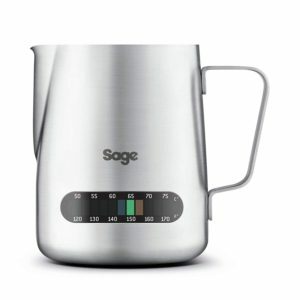 This jug has a built-in temperature strip so you can when the milk is at the perfect temperature. Again, nothing earth-shaking – but a nice touch nonetheless. So onto performance. I don’t want to labour the point, but the more manual way of producing coffee means that the performance and the quality of the coffee produced is subject to vary somewhat, but that being said the coffee produced here was very good. This unit employs a pre-infusion process, which soaks the ground beans a little before blasting them with the high-pressure water. The soaking allows the beans to expand and open up a tad before the high pressure releases all of the flavours. The steam wand did a very decent job of frothing and heating our milk for a latte – although it was a bit on the slow side. And I think this is where my main – and probably my only – gripe with the Barista Express is. For a machine that is marketed as a quick coffee maker, it isn’t really that quick. This isn’t through any fault of the machines – indeed the grinder is good and efficient, the brewing of the coffee is good, with the pre-infusion process doing a sterling job in drawing out the flavour of the beans and the steam wand does exactly what a steam wand should. But none of this screams rapid coffee to me. If you want truly rapid, no-fuss coffee you would have to spend a fair bit more in my eyes and get a fully automatic bean to cup machine such as the Jura S8. But if you put that to one side, this is a more than capable BTC machine. It has some really neat features and sits tidily on the counter-top. The price point is exceptional for the quality and I’d happily brew coffee with the Sage Barista Express every day. I’m just not sure it is what the makers think it is, and if you go into purchasing one thinking that it will be a case of ‘touch a button and go’, then you may be a bit disappointed.